Solvay announced that Scinor Beijing Membrane Technology chose Solef PVDF to optimize its TIPS membrane technology. TIPS – for Thermally Infused Phase Separation – has applications in reverse osmosis pretreatment as well as industrial and drinking water applications. 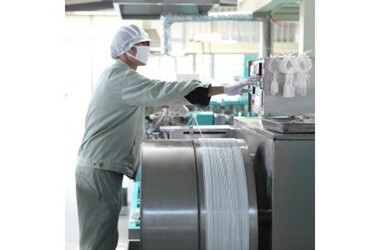 The excellent chemical resistance of Solef polyvinylidene fluoride (PVDF) was one key factor in Scinor’s decision, as well as Solvay’s exacting suspension polymerization process for the material, which makes it possible to produce homogenous, linear fibers that are ideal for TIPS and similar ultrafiltration processes. Scinor’s TIPS technology offers a unique, new alternative to more conventional Non-solvent Induced Phase Separation (NIPS) solutions. Unlike NIPS, TIPS filters are isotropic, meaning their mechanical properties are more uniform throughout the membrane structure. Due largely to the consistent quality of high-performance Solef PVDF, this uniformity translates into lower fiber breakage and more consistent, reliable filtration. The end result is that Scinor’s TIPS membranes can deliver higher flows while consuming less energy. Solvay’s Solef PVDF and Scinor’s TIPS membranes are commercially available worldwide. Beijing Scinor Membrane Technology is an integrated corporation with capabilities in research and development of membranes, equipment manufacturing, and engineering design. With experience in system integration and diverse water applications, we can provide customers with custom integrated and comprehensive solutions for water treatment. We make great efforts in building world- class advanced water technology platforms. We utilize the most advanced water treatment technology in the world, promote the development of local water markets, integrate and apply advanced technologies, develop the international market of domestic membrane products and technologies, and continuously explore the sustainable development of water resources. Solvay is an advanced materials and specialty chemicals company, committed to developing chemistry that addresses key societal challenges. Solvay innovates and partners with customers worldwide in many diverse end markets. Its products are used in planes, cars, batteries, smart and medical devices, as well as in mineral and oil and gas extraction, enhancing efficiency and sustainability. Its lightweighting materials promote cleaner mobility, its formulations optimize the use of resources and its performance chemicals improve air and water quality. Solvay is headquartered in Brussels with around 26,800 employees in 61 countries. Net sales were €10.1B in 2017, with 90% from activities where Solvay ranks among the world’s top 3 leaders, resulting in an EBITDA margin of 22%. Solvay SA (SOLB.BE) is listed on Euronext Brussels and Paris (Bloomberg: SOLB.BB - Reuters: SOLB.BR) and in the United States its shares (SOLVY) are traded through a level-1 ADR program. Financial figures take into account the announced divestment of Polyamides. Solvay Specialty Polymers manufactures over 1500 products across 35 brands of high-performance polymers – fluoropolymers, fluoroelastomers, fluorinated fluids, semi-aromatic polyamides, sulfone polymers, ultra-high performance aromatic polymers, and high-barrier polymers – for use in Aerospace, Alternative Energy, Automotive, Healthcare, Membranes, Oil and Gas, Packaging, Plumbing, Semiconductors, Wire & Cable, and other industries. For more information, visit www.solvayspecialtypolymers.com.